Hi All, I'm stuck on the couch for the next few weeks with a torn Achilles. Happy to help with any signature banner requests, I'm already making a few for the Adopt a Bronco thread! Let me know! Well, I had to be that guy again, and take Darian Stewart. If you could slap one together with Template #4, that'd be boss. I'll CP you a couple times, since I decided to be different. Thx a million. Hey, almost forgot. Get well soon. I've never had a torn Achilles, but everyone says it stinks. Here's to a speedy rehab. Last edited by Spice 1; 09-02-2018 at 06:45 PM. Sure! What do you think of the below? Let me know if you want me to make any edits, happy to help! And thank you for the Get Well note, hopefully I'll be back on my feet soon! 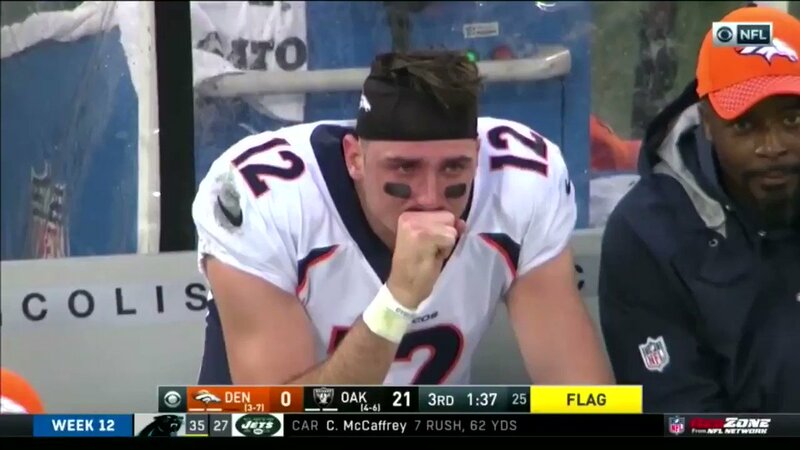 I am considering updating the Josh McDaniels to a crying Paxton Lynch gif sig. Can you do it? That's a good one. Can you add this to it? Can I please get one made for Phillip Lindsay?